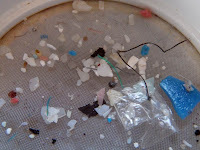 The Great Pacific Garbage Patch is a heaving flotsam of plastic in the North Pacific Gyre. It's bigger than Texas. And it's not the only repository of plastic garbage. 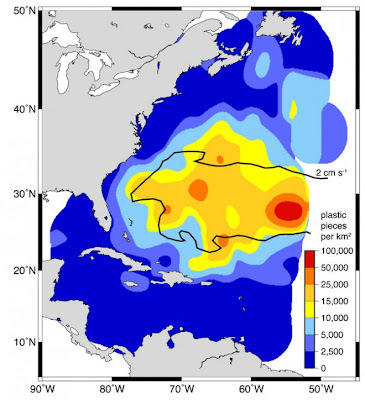 Millions of pieces of plastic — most smaller than half an inch — float throughout the oceans. 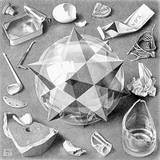 They are invisible to satellites, and except on very calm days you won’t even see them from the deck of a sailboat. The only way to know how much junk is out there is to tow a fine net through the water. The plastic already in the ocean is doing its damage, and there's little we can now do about it. What we can do is stop adding more. Stop buying beverages in plastic bottles, especially water. Choose purchases without plastic packaging. Don't buy things made of plastic where other alternatives exist. Employ reusable cloth or canvas bags when shopping instead of single-use plastic bags. Recycle plastic. Stray plastic eventually finds its way into our oceans, and it can stray, even from trash receptacles, with very little wind or other action.